Grounding systems are critically important to wireless communications systems. Caltrans District 2 recognized the need to develop a standardized approach for ground system design, implementation and construction for Intelligent Transportation Systems (ITS) field elements. 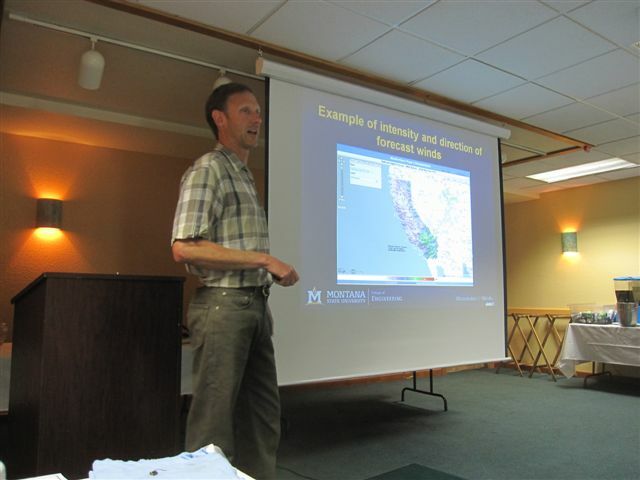 Mr. Pearce explained how the varying ground conditions within Caltrans District 2 were accurately modeled for the purpose of defining a standardized ground system design methodology. Applicable study sites were Highway Advisory Radio (HAR) transmitters and mountain top communications sites. Jeremiah Pearce from Caltrans District 2 explains ground system design and implementation for HAR and mountain top towers. 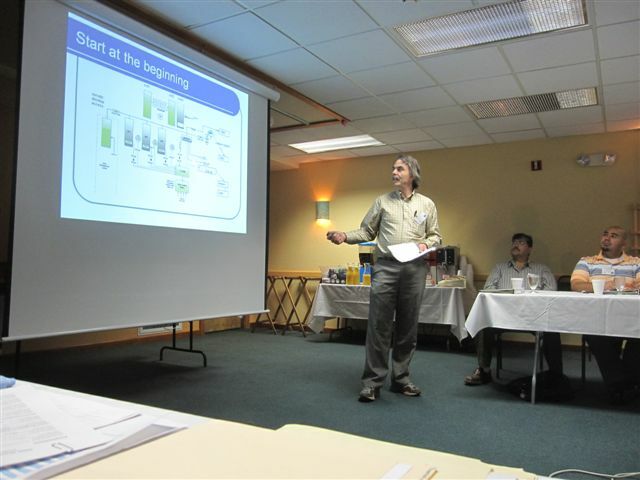 WyDOT’s Paul Andersen explained the design, deployment, and current and anticipated use of an Ethernet/IP backbone network that will bring long haul communications back to the WyDOT’s headquarters in Cheyenne. Additionally, the creation of individual networks serving roadside ITS devices allowed WyDOT to adopt a standard approach to rural roadside communications. Paul Andersen, Communications Systems Supervisor for the Wyoming Department of Transportation, explains the need for creating an Ethernet/IP Backbone for WyDOT. 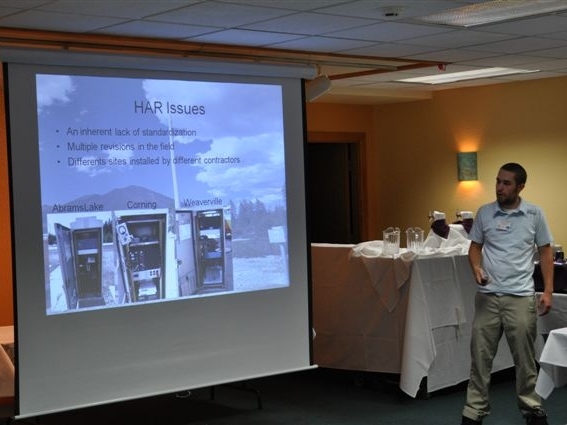 Representatives from the STAR Lab at the University of Washington, with support from WSDOT, discussed the development and field testing of a Video-Based Vehicle Detection and Classification system. They showed a number of real video examples of the working system and described the test results under various challenging conditions, e.g., rain, fog, darkness, and camera vibrations. 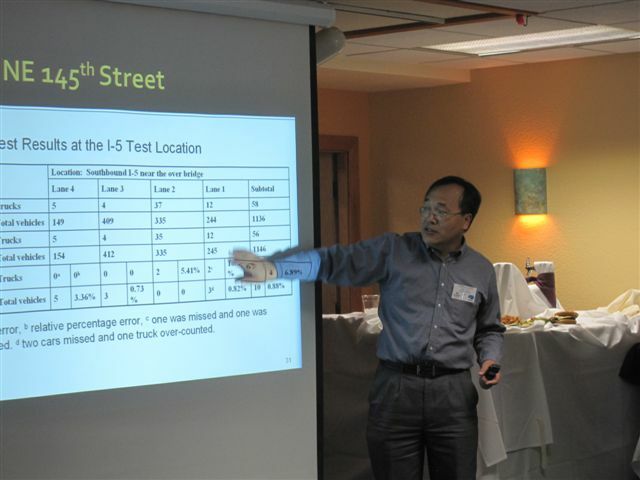 Yinhai Wang from the Smart Transportation Applications and Research Laboratory (STAR Lab) of the University of Washington shows test results for the surveillance video camera traffic detection system they have developed. Yegor Malinovskiy, student researcher in the STAR Lab at the University of Washington, explains image processing for surveillance video cameras used to collect traffic data. Along one of the nation’s steepest and longest grades on an Interstate, Caltrans District 6’s team led by Jose de Alba developed and implemented a fully automated truck escape ramp notification system. Using new and existing technology, the system detects a vehicle upon entry to the escape ramp, activates EMS’s, records the incident on a CCTV, and alerts Traffic Management Center personnel. 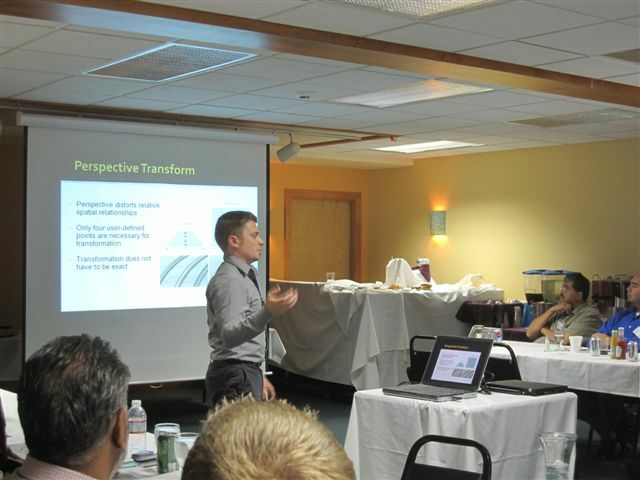 Forum participants viewed actual footage of the Run-Away Truck Escape Ramp in use. 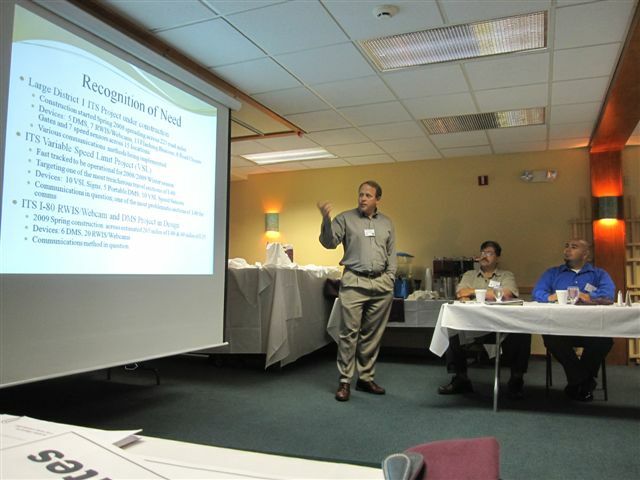 Jose de Alba, Caltrans District 6, discusses the run-away truck escape ramp system his team has developed. Idaho’s Traffic Management System (TMS) software accesses 32 Variable Message Signs (VMS) located throughout the state. ITD is facing difficult challenges with communications, especially with signs located in rural areas with challenging terrain. 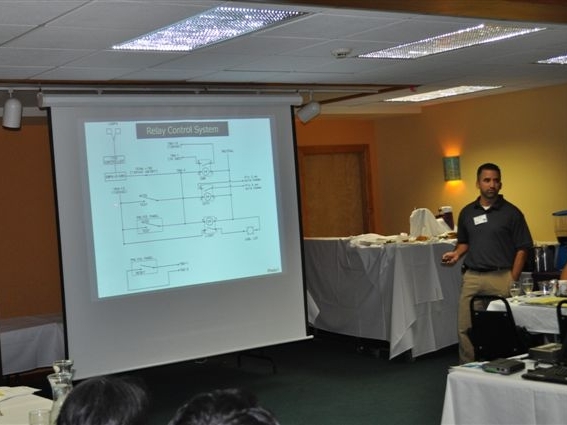 Mr. Blackshaw demonstrated how ITD’s TMS operates, how it communicates with ITS field elements, and what it takes to connect a VMS, HAR, or RWIS to a central software system. Mark Blackshaw, Idaho Transportation Department demonstrates their Traffic Management System. Dean Campbell from Caltrans District 3 built a simple electro-mechanical relay with a built-in web server to control field elements such as Extinguishable Message Signs, especially those in remote locations. For the presentation, he illustrated the actual layout of the system, including the Web Relay page, monitoring relay, status light and GPRS modem, and then demonstrated the webpage and exercised the relay. Dean Campbell, Caltrans District 3, shows the electro-mechanical relay he built to control field elements such as Extinguishable Message Signs. 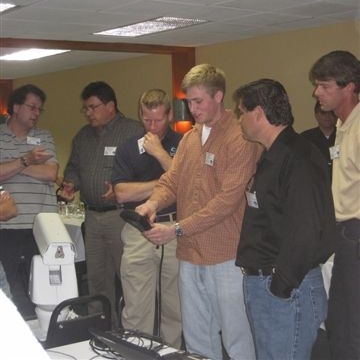 Michael Edwards and Ryan Huffman discussed the need, approach, technical design, field testing results, conclusions and development pitfalls for their ruggedized hand-held diagnostics terminal. The terminal is designed as a weather resistant alternative to a laptop computer for controlling and troubleshooting ITS field devices. The team developed specialized software for managing the terminal’s modules which interact with particular ITS devices such as CCTV’s, vehicle detectors, and CMS’s. 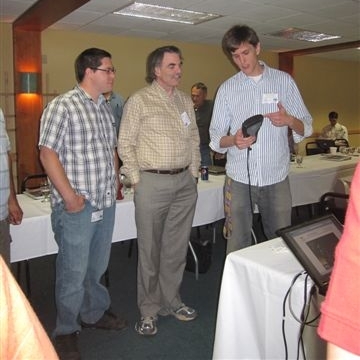 Michael Edwards (r) demonstrates to Forum participants Mark Blackshaw (center) and Keith Koeppen (l) the ruggedized, hand-held diagnostics terminal he has helped develop. 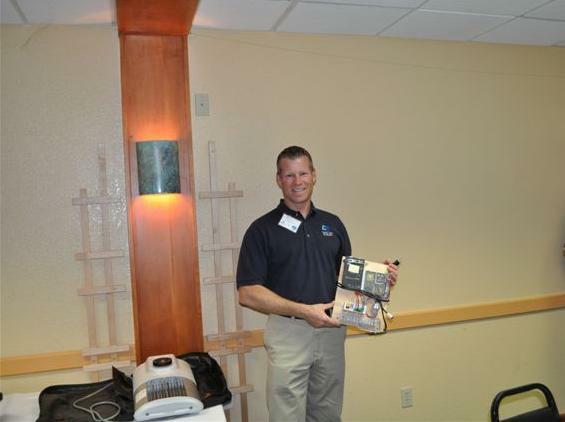 Ryan Huffman demonstrates the ruggedized, hand-held diagnostics terminal he has helped develop. The WeatherShare system aims to improve weather incident recognition and response by providing streamlined access to surface weather data from multiple sources. 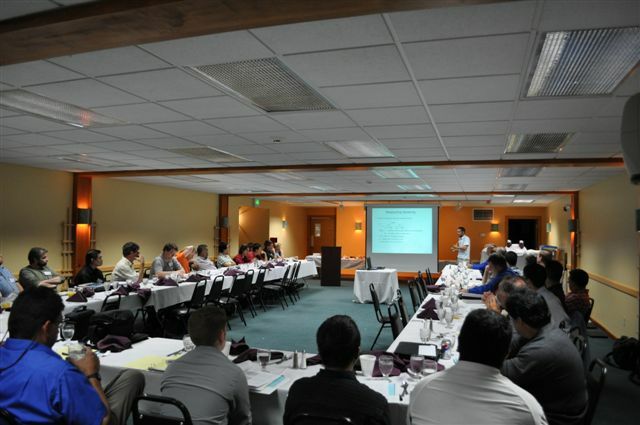 The research team discussed the steps taken, decisions made, and the tools and techniques used in developing the WeatherShare system, as well as some of the problems encountered along the way, from the perspectives of both technical development and usability. The WeatherShare system is currently live and the team demonstrated many of the available features. 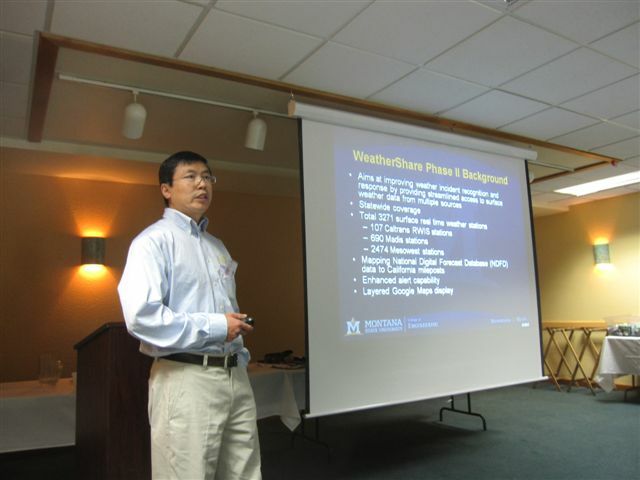 Shaowei Wang from WTI explains the design, development, and usability of the Caltrans WeatherShare System he has helped to build. Daniell Richter, WTI, demonstrates the Caltrans WeatherShare System he has helped to build.